Hope u are all doing good. Thanks for visiting by blog n giving ur wonderful comments. 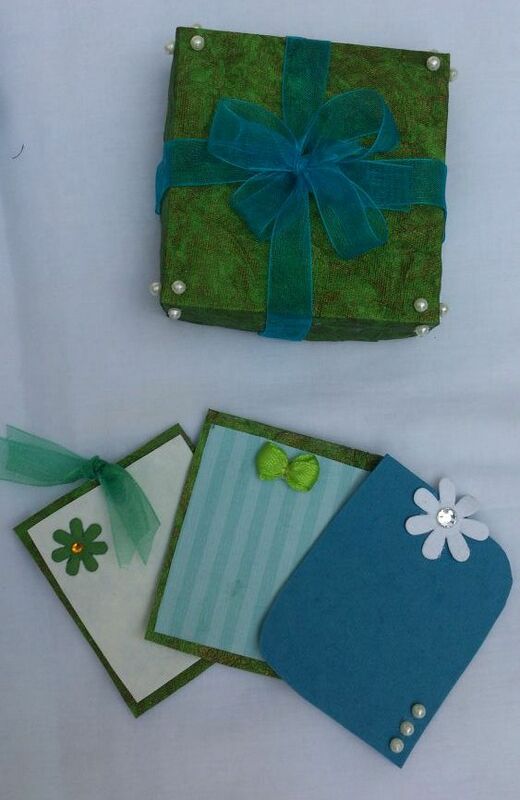 I have taken green, blue n used white as the neutral colour. 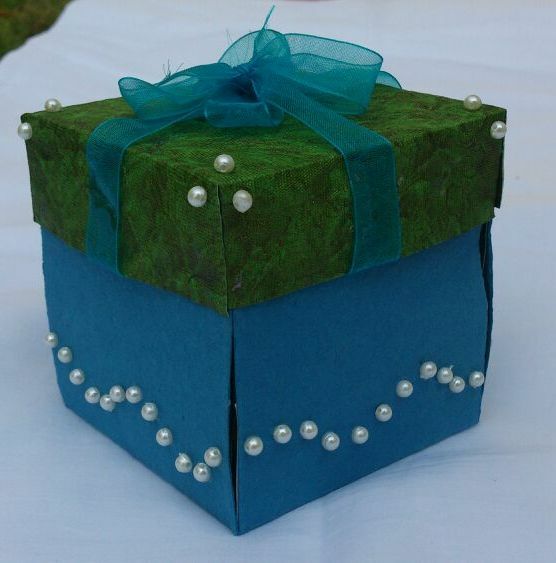 I have used lots of pearls, stones and sparkles for embellishments. 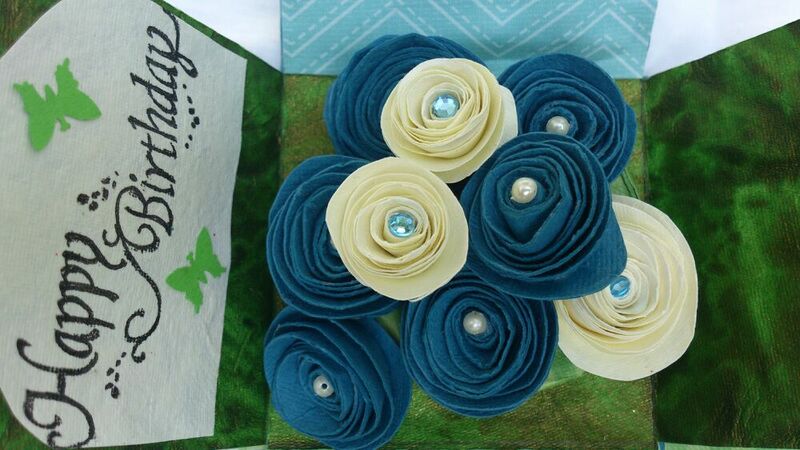 And the blooms.... they have turned out quite pretty right, it is simple spiral flowers which is easy to make. Wanted to make a basket but since it is a small box it looked clumsy in the centre. 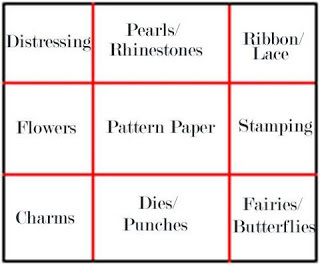 I have kept the tags simple, else ther would be no space to jot down something. Thanks a lot for stopping by and do post ur comments, it gives inspiration. 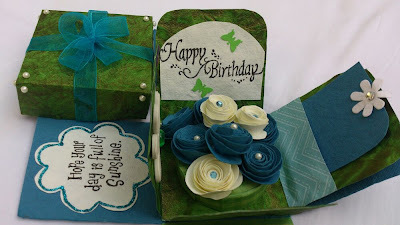 Great explosion box.I like the rolled flowers you used.Nice colour scheme too.I also love the ribbon bow on the top and the pearl accents.Thank you for playing along with us on Crafter's Corner Challenge #7.Wish you all the best. Pretty, just goes to prove that old saying of blue and green should never be seen is totally wrong. Love the flowers in the centre. 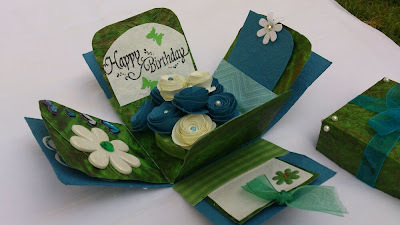 Thanks for sharing this with us at Unstampabelles for our Anything but a Card challenge. Great project! All those flowers look lovely. Thanks for joining us at UnstampaBelles. Wow Sujana!!! This is just BEAUTIFUL! Such a rich color combination and those cream roses just glow against it, very classy and elegant creation. I hadn't seen this before, I guess my explosion box with the flower pot is quite similar... great minds think alike eh? 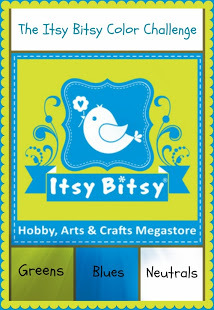 Thanks so much for playing along ItsyBitsy's Logo Color Challenge. All the very best! What a beautiful explosion box Sujana ..I really like the rolled roses in the center and all the amazing details and colors you have used here !! Those flowers look stunning! Great work on the explosion box. 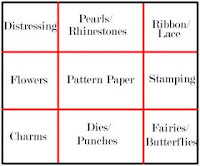 Thanks for sharing at Unstampabelles. AMazing WOrk Sujana... its awesome! !